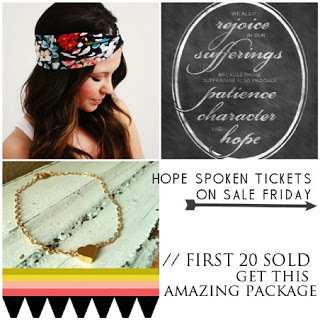 Hope Spoken is a women's conference where we all can come to know Jesus more, and make Him known in our lives. Our conference will be filled with stories. Stories of Christ in each of our lives, and how we can use these stories for His glory. This is a weekend to rest and feel His love, to lay burdens and hurts down and feel His grace. We want to let women know that they are enough, to encourage women to use their passions, their words, and their creativity for the Lord. We, above all else, want to glorify Jesus' name and share the hope we have in Him. Y O U A R E L I V I N G Y O U R S T O R Y.
T E X A S .
Tickets go on sale March 1, 2013. Purchase your tickets here. I can not tell y'all how excited I am about Hope Spoken! It has my heart and passion all over it....to give hope a voice. ...to not only live it and speak it, but to share it. Danielle, Casey and Emily and the group of women putting this together have a vision to bring women together...to be encouraged by the stories of others but also to empower them to tell their own! All for the glory of HIM. I am completely honored and excited to be a part of it as one of the small group leaders. Among some amazing speakers, worship times, a friday night party and much more....there will also be small group times throughout the weekend! I can not wait to meet every one of you who attends and connect one on one with those in our group! Who is Hope Spoken for? Women. You, your sister, your mother, your best friend, women seeking Hope in Jesus Christ, and Him alone. This conference is for women of all ages. We want to strongly emphasize that, although many of us involved in this conference are bloggers, this conference is not just for bloggers. The first 20 people to purchase tickets will get this bundle of goodness. So, I will be there! Will you?! I would love to hug you and hear your story! P.S Tickets are up for sale NOW! !